Arsenal chief executive Ivan Gazidis will meet Mikel Arteta's representatives this week to discuss an improved contract for the midfielder. 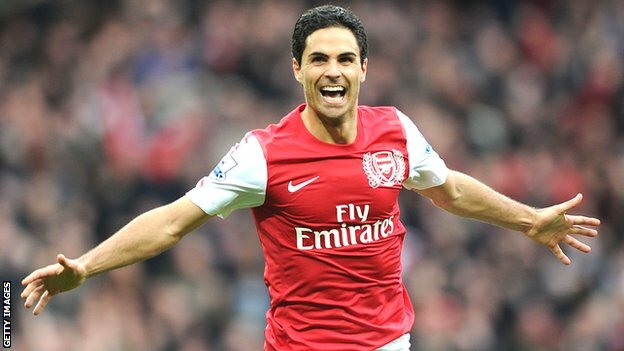 Arteta, 30, is understood to have taken a pay cut of £10,000 a week sign from Everton for 10 million pounds last summer. The midfielder signed a four-year deal worth a reported £60,000 a week and has asked the club to review that following an impressive first season. He started the 2011-12 campaign at Everton, playing three games before joining the Gunners for on the final day of the transfer window last August. The Spaniard established himself as a key member of the Arsenal side that finished third in the Premier League, but missed the final month of the season with ankle ligament damage. Arteta joined Everton from Real Sociedad in 2005 after spells at Rangers and Paris Saint-Germain. Arsenal are yet to hold contract talks with winger Theo Walcott, who is on England duty at Euro 2012, and there are no developments in their negotiations with captain Robin van Persie. Both players have a year left on their contracts.